It was a great day at the Myers Park library last Saturday because the one and only E. K. Smith was here, author of the terrific Alien Dude series of books. What makes these books so terrific, other than they are fun and exciting? They are written for BOYS!! Ms. Smith had a boy of her own and, when he was starting to learn how to read and having a hard time, she looked around but couldn't find anything he, or any boy, would like. "Everything was babyish," she told me. So she took the situation into her own hand and wrote Alien Dude and The Attack of Wormzilla and Alien Dude: Mr. Evil Potato Man and the Food Fight. (good books--see my reviews here) So I was very excited for a long time about her visit. And it was a good time. She showed slides of her books, talked about writing them, how she got ideas from her son (!!) and how she worked with the illustrator. We had a small crowd--well, really small because it was only one guy (his name was Kenner) but we still had fun. In fact, Ms. Smith talked about some upcoming Alien Dude books and said our hero will get a sidekick. Kenner then suggested that the sidekick be a robot dinosaur and Ms. Smith liked that idea. So his idea may actually end up in a book! See what could happen when even one guy talks with an author!! 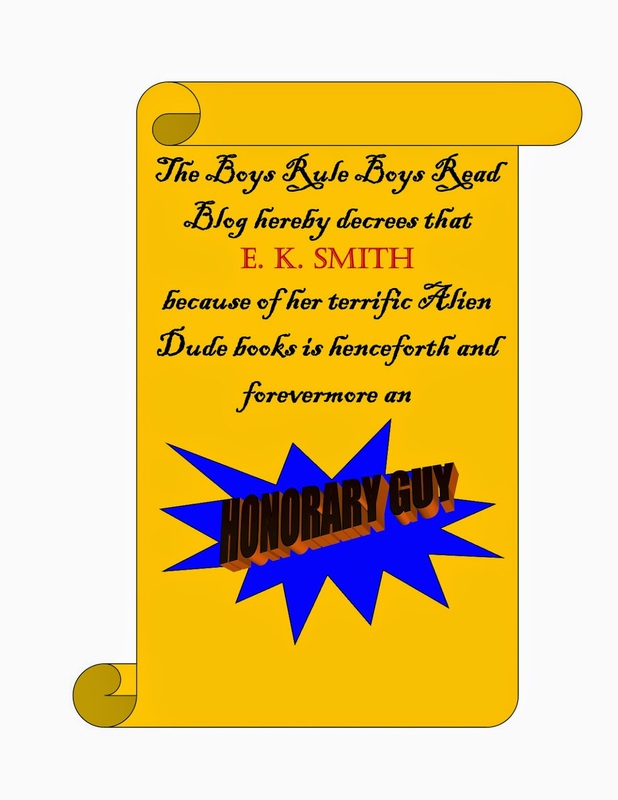 Ms. Smith, because of your outstanding workon behalf of boy readers, this blog is going to give you the highest honor it can possibly offer by making you an Honorary Guy! That's right--you now have the right to make obnoxious noises at sporting events, crack all the goofball jokes you'd like and eat insane amounts of foods with no nutritional value. I'm sure you're amazed and overwhelmed at the awesome greatness of this exceptional honor but there's no need to thank us--you've earned it!! All silliness aside, we truly appreciate your visit, Ms. Smith, and look forward to more terrific Alien Dude books!